Claimed to be xxcross and sune pll skip. I'm still not completely convinced tho tbh. I saw it on QiYi’s Instagram. People have said on fb that delegate confirmed it, and cubingchina doesnt seem immature enough to do this. Likes: Rubix Noob and Thom S.
If it was such a lucky scramble, I'm surprised no one in the round got great results on the solve. Seems a bit suspicious. Everything else adds up, however. Good cuber, correct scramble and all. I'm quite skeptical about this. He got a 9.00 average. His best is a 6.03 in comp. This has to have been a mis scramble because no one else got good times on this scramble. They must have seen the XXCross too. I doubt this honestly. Cool stat - proportionally speaking, this is the second biggest drop in the 3x3 single WR in the WCA era. Erik's 7.08 is first, at 81.2% of the previous record of 8.72. 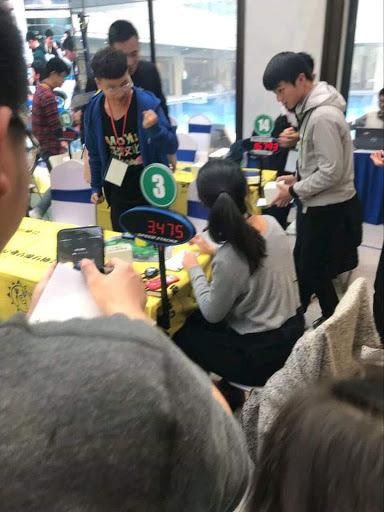 Though Yusheng Du's 3.47 isn't far behind at 82.2% of 4.22. It's only a 0.75 difference but we need the scramble, video, anything! Might be a scrambler scrambling the cubes wrong on purpose and led to a 3 again. No one else got good times on their 2nd solve, granted they might have been in different heats but Antoine Cantin was there and you'd think he would get a better time. This is just crazy. We should all be skeptical for the time being until there is an official announcement or whatever.